You've just been elected mayor, Congratulations! Unfortunately the citizens have some pretty big demands: jobs, a theme park, a couple of cheese factories, and maybe even a radio tower. A tough proposition since the city currently consists of a wheat field, a bakery, and a single die. Armed only with your trusty die and a dream, you must grow Machi Koro into the largest city in the region. You will need to connect oncome from developments, build public works, and steal from your neighbours' coffers. Just make sure they aren't doing the same to you. Machi Koro is a fast-paced, lighthearted game for you and up to 3 friends. Once you've had a taste of Machi Koro, this infectiously fun game may have you wondering if the dinner table ever served another purpose other than gaming. They say you can't buils Rome in a day, but Machi Koro will be built in less than 30 minutes. A city building card game that offers more than one way to win First impressions: Really easy to play, roll dice, check effects, buy cards to get more effects. First Play: Played with slightly alternate rules which don't put all of the purchase cards out at once. This made it better as there was no one clear way to win Later plays: Finding it hard to put this game down, it has almost limitless replay value and no two games will be alike. Get the Harbour Expansion, it's an absolute must! 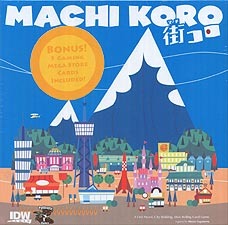 Machi Koro is a very fast-paced game for 2-4 players, which takes approximately 30 minutes to play (dependant on the number of players). The aim is for each player to develop the city in order to complete all of the landmarks under construction faster than their rivals. On each players turn, they roll dice (at the start normally roll 1 and then once you build one of your landmarks you have the option to roll 2 dice). If the sum of the dice rolled matches the number of a building that a player owns, they get the effect of that building; in some cases opponents will also benefit from your die (just as you can benefit from theirs). The second part of your turn is to buy buildings these buildings all have their own unique ability some give you money on your turn, some on anyones turn and others take money from the person who rolled the number!! The first player to construct (on each of the landmark cards there is a cost when paid the landmark is offically constructed) all of their landmarks wins! A clever little game, good for families and newcomers to the hobby would class this as a very light filler game / gateway game. There is a strategy you can use that will let you win however this should be fixed by the habour expansion. My only gripe is that I think that the expansion is compulsary and should have been incorporated in the base game. Having said that this is an awesome little game and one I would definately recommend.